Wesley So did what his more experienced rivals have failed to do so far in Shamkir – beat outsider Rauf Mamedov – to take the lead on 3.5/4. 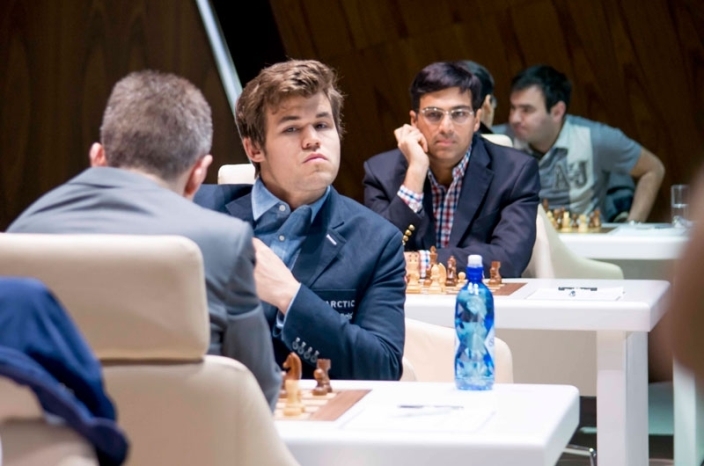 World Champion Magnus Carlsen did everything in his power to keep pace, but even an exchange sacrifice against Michael Adams wasn’t enough to upset the balance. 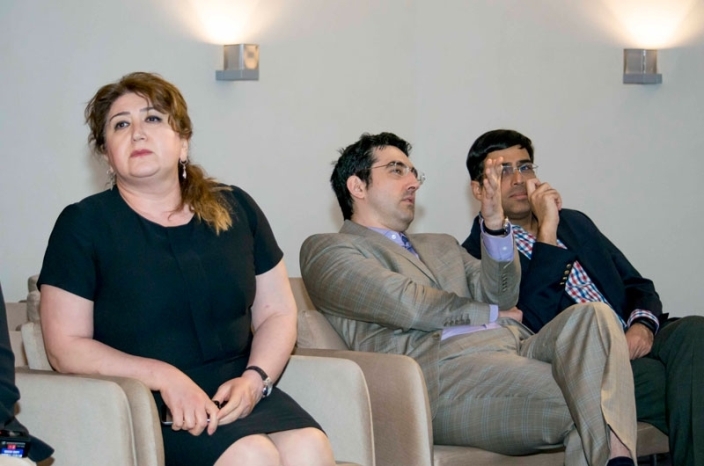 The other draws were relatively quiet affairs, though Kramnik and Anand at least gave exposure to some spectacular theory. 1. e4 c5 2. ♘f3 ♘c6 3. d4 cxd4 4. ♘xd4 g6? Ok, this is a huge exaggeration, but are there really still people left who want to play with Black against the Maroczy? And even more so against a player with the positional understanding of Wesley So! 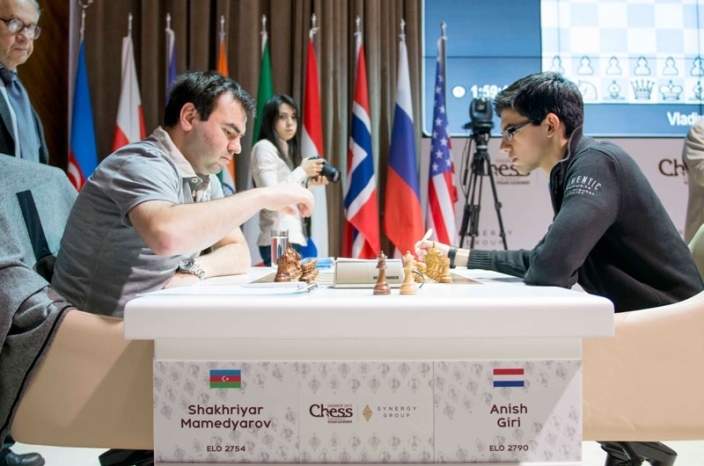 I think it might be at least more advisable against more dynamic players such as Maxime Vachier-Lagrave or Vishy Anand. 5... ♘f6 6. ♘c3 d6 7. f3 ♗g7 8. ♗e3 O-O 9. ♗e2 We're in one of the main lines, which has been considered to give White a slight edge since long before So was born. 9... ♘h5 When I saw that Mamedov was playing the Accelerated Dragon I thought: "He must have a surprise up his sleeve". And here we have it! A move that's barely been played and never between grandmasters. Mamedov wants to jump to f4 with the knight, taking advantage of the pressure on d4. What struck me, though, was that So responded in only 9 seconds! It demonstrates how ultra-prepared So is - how can he have looked at this line? How can he remember it so well? Doesn't he need even a few seconds to review it? Why are you so good, So? The move, although logical, isn't one of Stockfish's first options, so Mamedov now began to think - the trapper was trapped! It prevents the knight jump and its only drawback - the weakness of h3 - isn't so easy to exploit, as we'll see. 10. O-O ♘f4 would allow Black to exchange off the bishop on e2, with rough equality. 11... ♗h3 doesn't pose many problems for White. For example: 12. ♗xg7 ♔xg7 13. ♕d2 and g4 is already threatened, since the f4-square is covered. The bishop would have to go back or get trapped: 13... ♖c8 14. g4 ♘f6 15. ♖g1 with Rg3 to follow. 12. f4 ♘f6 13. O-O After the little tricks in the opening we've returned to the familiar scenario: a small but persistent edge for White. 13... ♖c8 14. b3 ♕a5 15. f5! So takes preemptive action against any breaks by his opponent by seizing the initiative immediately. It's important to note that although the e5-square is weakened there's no route by which the black knight can get there. 15... ♗d7 16. a3 Continuing to strangle his opponent. 16... b5 is the kind of counterplay Black is dreaming of, but after 17. b4 , followed by cxb5, he'd wake up to the reality... life a pawn down. 18... hxg6 19. e5 is similar to the game. Mamedov wants to use the f-file in order to exchange a pair of rooks and alleviate the pressure. 20. ♗xa7 is the machine's suggestion, but one no human would take seriously due to 20... b6 although Stockfish goes on to demonstrate that the bishop isn't so bad there: 21. c5 ♗h6 22. ♗xb6 ♗e3+ 23. ♔h1 ♕e8 followed by Bd4 and Nd5, with good compensation. 22... ♖fxd8 when the following line is more or less forced: 23. bxc6 ♘xc3 24. cxb7 ♘xe2+ 25. ♔g2 ♖b8 26. ♗xb8 ♖xb8 27. ♖ae1 ♘d4 28. ♖b1 The white pawn on b7 is a real nuisance but the black minor pieces can find fixed positions in the centre. A win for White would be much less trivial. 23. ♖xf8+ ♖xf8 24. ♗xg7 ♔xg7 25. ♖c1 ♘xc3 26. ♖xc3 ♗d7 27. c5 If you want to practice your endgame technique I recommend you play this position with White against the computer, or a friend who's willing to suffer. There's nothing better than targetted practice (with later analysis) to notice a clear improvement after only a few sessions. 27... ♖c8 28. a4 ♔f6 29. ♔f2 White's plan is clear: create a passed pawn on the queenside and queen it, but it's important to first bring the king into the action - especially as the black king is threatening to make a dash for d4! 29... ♔e5 30. ♔e3 Thou shalt not pass! 30... ♗e8 31. ♗f3 ♖c7 32. ♔d3 So brings his king to c4 in order to free up the rook and also prepare for a future invasion via c5. Wesley knows he's got him! 32... g5 33. ♔c4 h5 34. a5 All together now. 34... g4 35. b6 axb6 36. axb6 ♖d7 37. ♖e3+ ♔f6 38. c6 It's over. 38... bxc6 39. ♗xc6 ♖d8 40. ♗xe8 ♖xe8 41. b7 The ease with which So won this game is something I think is only within reach of two other giants of modern strategic chess: Carlsen and Kramnik. Probably that motivated me because on my last tournament I had a lot of losses and I lost almost half my games, so that kind of motivated me to work harder. I was trying to figure out why that happened and what my weaknesses are and I tried to solve them – it’s daily work. He was pressed for more details about that work and kept talking, but he’s already learned the super-GM trait of not actually giving away any trade secrets! I just decided to forget about the past and move on. I figured out some of the weaknesses I have and I work every day with a board and analyse some games. I think it’s just important that you keep fighting every game and you focus every single game and not care what other people say… I had a lot of critics and people not really wishing me well. I just decided to completely forget about what anybody says and focus on my games. I think that’s also what Vishy Anand does during his World Championship matches. I think he doesn’t go online and check what other people say. I wish the tournament was over, but fortunately it’s not. 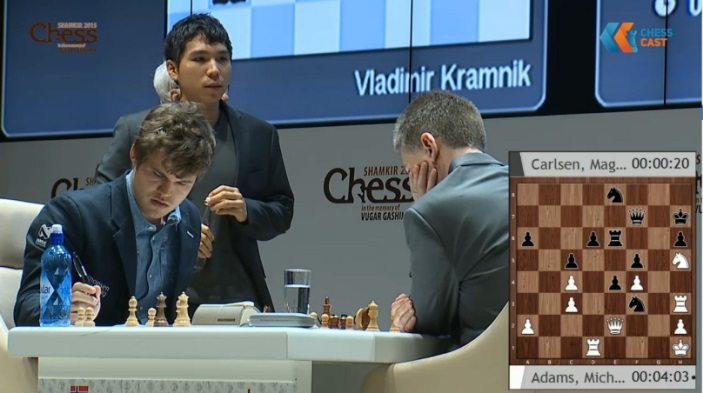 The key game elsewhere was Adams – Carlsen. This was perhaps a tad risky, but I didn’t see any other way to play for something… I just didn’t think my chances were too great if we just play slowly. He’ll unravel with g3, Ng2 and I can’t really get to the knight on h5. It seemed that it’s easier for White to play. I really tried hard to find something that probably wasn’t there. I don’t think the quality of the games has been too great, but my score is more than satisfactory with three black games. It’s looking good. It’s good for me and my team to get some of our food that we really enjoy. It improves the mood. Adams, meanwhile, was happy to have played his best game so far, which wasn’t really saying a lot. “The trend is good”, he noted wryly. Elsewhere more than a draw never looked likely. 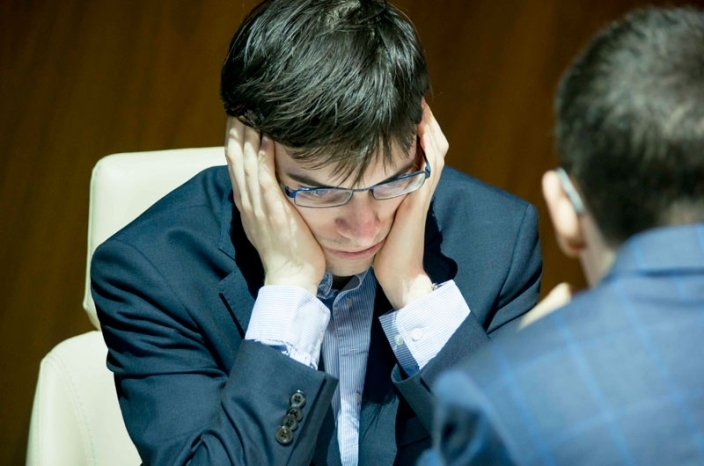 Caruana played a razor-sharp Grünfeld against Maxime Vachier-Lagrave, and when the Frenchman found himself taken somewhere he hadn’t checked recently he steered towards a safe draw, with Caruana admitting that towards the end, “mainly we’re trying to get to move 40”. I knew it would be a tough start because I have three Blacks. Yesterday was really unnecessary. Even if I didn’t get anything in the opening I should have just finished the game. It was a dead draw. I haven’t really shown fighting spirit because of the openings. Here Giri went for the neat pawn sacrifice 23.d5! exd5 24.exd5 Qxd5 Re5, when White’s chances looked decent against Black’s uncoordinated army. 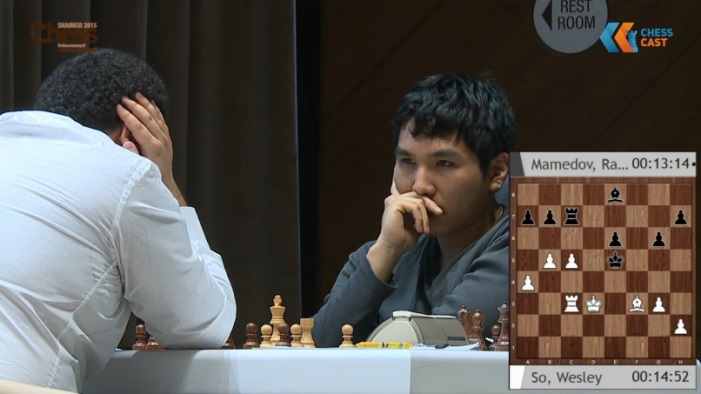 Mamedyarov soon managed to exchange queens, though, and the subsequent disappearance of all queenside pawns marked the end of the game. I like the Catalan and I’m trying to play it against everything. He was highly critical of the move and kept suggesting alternatives (26.f3, 26.Kf1, 26.h4) but it was by far the computer’s top choice, leaving Anand to find an only move, 26…c5! – he did, and the game finished in a harmless opposite-coloured bishop endgame. +2 or +3. It’s not great for me. Maybe Vishy is one of my most difficult opponents in my career. I haven’t won a classical game for a long time, which is of course a bit uncomfortable. Maybe one day I’ll manage. In my opinion chess has never been more interesting! I don’t know if it’s that I’m able to understand everything that happens in every game, or quickly, but over the board play has become very dynamic… It’s not like people weren’t complaining about preparation before the computers came along. The fear of chess being played out is as old as the hills. We have to work three times more than at the time when I started chess… At the beginning of my career you could build a repertoire and play it for a couple of years, but now it’s different. 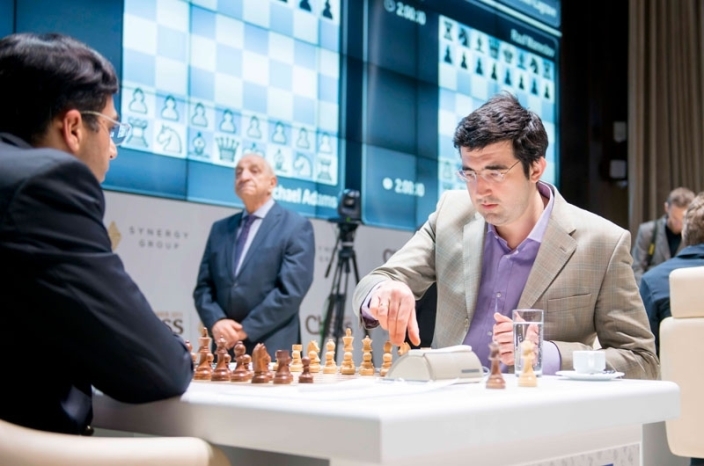 In Round 5 the focus will be on how So handles Anand with Black, while there are also the youthful battles Caruana – Giri and Carlsen – Vachier-Lagrave.